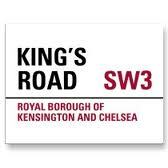 The King’s Road is one of the poshest addresses in London. It runs for a two mile stretch through the heart of Chelsea from Sloane Square to Stamford Bridge and is lined with fashionable boutiques and trendy restaurants. It’s name comes from its bygone use by England’s Kings as a private road from Buckingham Palace to the estates and gardens in Kew and Richmond-upon-Thames. When I am in London, I travel along The King’s Road on my way to the gym. Each day for many years, I noticed a homeless man who had established himself, along with his sleeping bag and shopping cart of worldly possessions, in a protected area on The King’s Road under an overhang next to the Chelsea Fire Station. It is some of the most expensive real estate in the world.